Chapter 16 – Personal Issues: Timeline And Checklist – 16 Things To Do Two To Eight Weeks Before Surgery. How To Get Your Personal Affairs In Order – Nobody will really say this to you, so I will – not every operation or outcome is ideal. Make sure your living trust or will is current and easy to find. Additionally you should have a Durable Power of Attorney for Health Care in place. This documents names the person(s) you delegate to make healthcare decisions for you in the event that you are unable to do so. Leave A Breadcrumb Trail – Nobody wants a worse case outcome, but just in case leave a list of your banking and brokerage accounts, your home mortgage information, life insurance policies and a place for all passwords to access your computer. Additionally create a folder if there is any other data that will be important to your family. Planning For Child Care – Most people who have hip replacement surgery are well beyond the parenting years, but if you are younger hip replacement candidate and have kids, you will need assistance with your kids. Consider having a parent or in-law live with you for at least a month while you recover (use in-law as last resort). Handicapped Placard – In most states you will coordinate a temporary handicapped placard via a staff member at the orthopedic surgeon’s office. Hip Tip – Handicapped Placard: Get the handicapped parking placard before you have surgery. Hotel Accommodations (Make The Night Before Surgery Stress-Free) – If you are coming from a distance or simply want convenient proximity to your hospital consider booking a hotel the night before. Hip Tip – Hotel Reservations: Book a hotel reservation well in advance if you will stay near the hospital the night before your scheduled surgery or if your loved one will stay in a hotel near the hospital. The hospital I used has a hotel in the same building for patients and families. These rooms often are very limited so plan accordingly. Hip Tip – Hotel Reservations: I had a private hospital room which included an optional pull out bed so loved ones could stay overnight with me. I advise that they don’t stay in your room as you will be asleep and they will be uncomfortable in that environment. Plan Your Own Film Festival (Planning For Your Mental Recovery) – You will be immobile so you may want to order a few books to read or movies you have been wanting to watch for a while. It will be a good time to relax and watching movies, or reading books, works well for many people. Hip Tip – Cable Movies: Many cable companies offer a free period for stations like HBO. Check with your provider to see if you are eligible. Hip Tip – How To Plan Prepare For Your Mental Recovery – When you sign up for Amazon Prime you will get free shipping to your door. The advantage for this is that you are not going to be able to go to the store or mall very easily at first and this can save you time and money, plus it is very convenient. Amazon includes free streaming movies and TV shows with this service. Unless you have a smart TV, you will need a device like a Roku 3 Streaming Media Player or Amazon Fire TV device. Many more additional tips are included in this chapter, including both Patient Organizational List and a Caregiver Organizational List . Hip Tip – NetFlix Free Month: Netflix offers one free month of service for you to test. That first month period is your most difficult recovery period. Hip Tip – Amazon Free Shipping: When you sign up for Amazon Prime you will get free shipping to your door. The advantage for this is that you are not going to be able to go to the store or mall very easily at first and this can save you time and money, plus it is very convenient. Amazon includes free streaming movies and TV shows with this service. Caregiver Preparation – Often the stress of an upcoming surgery can cause you to become frazzled. Your caregiver can help prepare both for their experience and your experience by visiting your home prior to your surgery and setting up anything to make the caregiver’s role as easy as possible. 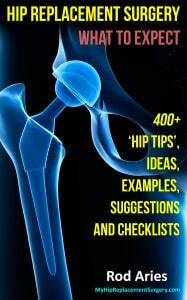 Hip Tip – “Who Has To Tinkle?” About six months after my hip replacement my 78 year old mother required surgery. My sister lives with my mother (don’t ask) but even though I was 30 miles north and they were 60 miles south of the hospital, it was more practical for me to take my mother to the hospital. My mother at first thought that I was going to drive down and take both her and my sister to the hospital, but soon figured out that I would be the only person with her. She promptly informed that she wasn’t going to the hospital unless my sister went as well. After much poking and prodding we figured out that she wanted my sister to be there in case my mother needed to go to the bathroom (she called it ‘tinkling’ when we were kids) and required assistance. Furthermore she stated that I wasn’t going to help her use the rest room. I explained to my mother that only hospital staff was allowed to assist in this process as the legal liability is so great in case there is a fall or other accident. Once my mother understood the great tinkle mystery it was confirmed that only I would need to drive her to the hospital. The great tinkle mystery was solved. > Bring something to read. > Bring a laptop or tablet (check with the hospital for their policy on electronic devices). > Work on that book you have always wanted to write. > Perform household tasks such as paying bills. > Bring along a pillow, a small blanket and a change of socks and underwear. > A bag with basic toiletries should include a toothbrush, toothpaste, a razor and cream, soap, deodorant, medications and any additional toiletries they require. > Waiting and walking around the hospital is not a call for high fashion, so wear comfortable shoes and clothing. > Bring something to read, but you probably won’t feel like reading. > Patient medications (many hospitals ask you not to bring them as they will provide your meds to you). > A cell phone and your cell phone charger (check with the hospital for their policy on cell phones). > Eyeglasses or contact lens supplies. > List of all patient medications, nutritional supplements, allergies and health conditions should be brought along. > List of other physicians being and their phone numbers. > Medical Insurance information and prescription cards. Alrighty… that concludes Chapter 16.